DESCRIPTION: For those who have already viewed a BHTV DVD published by Pen & Sword, this is another well-researched, scripted, presented and filmed work. The photography and lighting is first class with a good sound track. For those who have not viewed a BHTV DVD before and have only experience of broadcast tv programmes, this is a significantly better product than their previous experiences. Even the best tv historical documentaries tend to feature breathless professional presenters who may have little knowledge of their subject and attempt to dramatize the presentation and/or patronize their audience. This can take the shine off even the best-researched and scripted tv productions. The BHTV approach is very different. The presenters are former soldiers, historians and authors, many also acting as battlefield tour guides. Their starting point is the assumption that the audience already has some interest in the subject and may already have studied it with some enthusiasm. As former soldiers, they have a feel for the terrain and this is important to the understanding of battlefields. Commanders seek to fight on terrain that favours them, making use of natural features to increase their potency in battle Every commander has some choice, but is also channelled by natural features, making the choice of beaches for landings, and routes of advance, significant factors in the eventual choice of battlefield and the outcome of a campaign. The BHTV team producing this DVD has followed the BHTV established approach, combining location filming with the use of maps drawings, paintings and artefacts to bring the battle to life. There is not need for artificial dramatics because the events the presenters recount are already dramatic. To add to the depth of information and colour, the presenters are working with members of the 1st 95th Rifles Living History Society who re-enact Napoleonic War battles. These enthusiasts build up considerable knowledge of their chosen period and take great trouble to ensure that they equipment themselves with accurate reproductions of clothing, arms and armour. Within their group, they faithfully reproduce the complete range of personnel making up a field army of the period. This provides an opportunity to see how the technology and practices of the past impact on the conduct of military campaigns. In this DVD, the history of the 95th Rifles is followed from their formation in 1800 to their first involvement in the Peninsular war. The rifle was seen during the American War of Independence as an important new weapon that required the formation of a new force and tactics to make best use of it. There was also an appreciation that camouflage was a desirable introduction. This follows the well-established habits of the British Army. Rather then being a formal monolithic structure along the lines of the Admiralty, Horseguards served as a system of directing the efforts of a number of almost autonomous formations. The Army was comprised of Regiments and Corps. Historically, the regiments were raised in a geographic area of the British Isles. There, their depots recruited from the surrounding area and trained soldiers who were equipped in the manner favoured by the Regiment. That structure has continued even into the 21st Century and the establishment of a tri-service MOD, replacing the separate Admiralty, War Office and Air Ministry. During the Napoleonic Wars, and through to Cardwell’s Army Reforms, later in the 19th Century, British Army officers purchased their commissions. Together with the geographic nature of regimental establishment, this led to each regiment becoming a family that looked to its own organization with pride, developing uniquely. Each Colonel decided on the equipment and uniform of his troops and on their method of training. That could lead to distinct differences in the capabilities of any particular unit and led to a language that could also be different. This diversity continues and presented some major challenges when computerization in the late 20th Century required the establishment of a data dictionary. Even a bullet was known by several different names. In simple terms, a Corps was most frequently formed to cater for new technology that might be required across an Army or as a discrete force. An example of this is the Royal Tank Corps, the Royal Army Medical Corps and the Royal Army Ordnance Corps, where a special group was established to introduce and manage a new technology that could not easily by distributed through the regimental structure. In the case of The Rifles, the light infantry was not fully favoured by Horseguards and there was consideration of setting a special regiment to develop tactics, and then break it up, spreading its personnel across the established line regiments. One reason for the survival of the Rifles as a unique formation was the outstanding performance of their men in Iberia, covering the withdrawal of the British force to Corunna and evacuation by sea. The first German forces serving in America began to adopt rifles and to exchange the Red and white uniforms, typical in the British Army. This made them more effective against the irregular American revolutionary soldiers. The standard musket used through the British Army and aboard ship was a relatively short-range weapon. The lose-fitting lead ball fired by the musket bounced down the barrel and spat out of the muzzle in a random manner. That was not a significant problem when armies formed lines or squares and fired over distances of less than 100 metres at similar formations that presented large targets. This was not greatly different from hitting a barn when inside with the doors closed. There was also little advantage in dressing troops in camouflage clothing because they were so close to the enemy in combat and frequently in open country, standing in their formal formations. In fact, the musket and the colourful uniform provided advantages. A muzzle loading musket offered the highest possible rate of fire because power could be poured down the barrel from a cartridge case or measured powder flask, the lead ball dropped down after it and then easily tamped down with a ramrod. The only other action was to prime the pan with powder and close the frisson. It was a simple process easily taught to new recruits and the loose tolerances were more than adequate in traditional fighting. Similarly, colourful uniforms clearly identified friendly troops from some distance and assisted a general directing his formations from high ground. In irregular fighting and in skirmishing, the requirements were different. Small numbers of troops moved freely across terrain, mingling with enemy positions and requiring some disguise. Green, grey and brown became more desirable colours and with the method of dying clothes in the 18th and early 19th Centuries, these colours changed with use, ending up as a roughly similar dull brown/grey mess that blended well with earth and vegetation in most climates. As a result, the newly formed Rifles were equipped with green and black clothing and equipment. Their rifled long arms were more carefully manufactured, lovingly cared for by their users, and provided a much greater range and accuracy than a musket, but at the expense of a lower rate of fire. That rate was reduced because the tight fitting bullet required more effort to load and also because the shot was aimed with much greater care, where a musket volley would be fired in the direction of the enemy rather than at a specific enemy. A bayonet, more like a sword, was better suited to the rifleman than the spike bayonet common to the musket. Cartridges were made with greater care, often within a platoon before battle. It was common for riflemen to carry a short wooden dowel to use in making up cartridges and it was also common to vandalize books for paper to roll around the wooden former, filling the resulting tube with powder and twisting the ends. Priming powder was typically dispensed from a powder horn worn at belt level. To these technical differences were added other variations from musket-armed line troops. The riflemen had two speeds of march, dawdle and quickstep, covering more ground than typical line regiments on the march and moving with greater care and awareness when deployed in skirmish and reconnaissance. 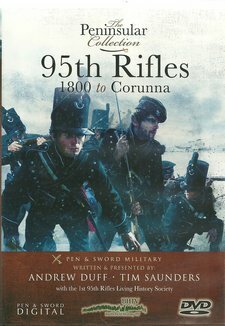 The DVD covers all of these important factors, in addition to providing a careful review of the Rifles from 1800 to Corunna. Having clips of re-enactments adds greatly to the presentation. The main part of the presentation covers the landing of British troops in the Iberian Peninsular and the march back to the coast and evacuation, including Napoleon’s brief personal foray into the area before he decided there was a lack of opportunity for him, leaving the campaigns in Iberia to his Marshals. The DVD also includes a brief account of the use of the Rifles at the Battle of Copenhagen, when they served aboard ship as marine light infantry, before taking their place as light infantry in the Army for land campaigns. In several respects, qualities that mark out the Rifles were not that appropriate to naval battles. Sharpshooters in the fighting tops fired down onto the decks of ships closely engaged and, as the death of Nelson demonstrates, were reasonably effective, but the range was short and accuracy not considered that important. For most naval small arms exchanges a more suitable weapon was the blunderbuss, firing shot, nails and anything else to hand, including broken glass, or the volley gun firing several bullets at the same time and where the barrels diverged, the classic handgun example being the duckfoot pistol with up to seven barrels splayed out to cover a wide arc ahead. Alternatively, seaman and naval officers would wear a pistol belt across their chests with a number of single and double-barrelled sea service pistols or horse pistols attached to the belt by long clips. That practice continued into the era of cap and ball revolvers, were Colt and Remington pistols issued for use at sea were usually fitted with a long metal clip extending down the side of the barrel to allow the user to attach it to a crossbelt, rather than using a leather holster, as would be common for infantry and cavalry. As most small arms exchanges at sea were during boarding of enemy ships, allowing few opportunities to reload and fire again, the weapons that were of greatest value were hanger swords, cutlasses, and boarding pikes, with the fighting more closely resembling a close quarter medieval battle.